Want to Get Published but Don’t Know Where to Submit? Here’s How to Get Started, With Your Intrepid Sidekick, Jobe. A few months ago, my film-major best friend and I met up for dinner and a movie. Now, if you guys have film friends, you know they are capable of finding some of the most hole-in-the-wall bizarre movies ever produced. I am fully aware of this. And that night, as always, I had this in the back of my mind. Lo and behold, it was suggested that we go watch this movie with Daniel Radcliffe in it. Now, if you know me, you know I am a Potterhead. No shame! With a brief summary of “it’s this movie about a guy who gets blamed for the murder of his girlfriend” I was game to try it. I like a good horror murder story. Below are some short thoughts on film vs. book. I’m not giving a detailed summary because I don’t want to spoil it for you. I just want to emphasize how important it is that you read the book. Ig (main character) dated this red-headed girl named Merrin. They met at church as children. They have a third-wheel friend named Lee. In the beginning of the movie, Merrin has been dead for a year and Ig has been accused of killing her. Ig has an older brother (Terry) who is kind of a trouble maker. He and his friend (Eric) like to blow things up with cherry bombs down at the docks. One day, (as a child), Ig goes with Terry and Eric down to watch them blow things up. For the last cherry bomb, Eric dares Ig to ride down a log rail naked. Ig does so and flies into the lake, bumping his head, and sinking under. Lee dives in and pulls him out. Ig receives the cherry bomb. On the anniversary of Merrin’s death, Ig wakes up with horns on his head. Through trial and error, Ig learns that these horns basically make him a personal devil to whomever he speaks with. People tell him their innermost evil desires. Ig uses this newfound ability to attempt to solve Merrin’s murder case. Without giving too much away, I’d like to note that the movie includes a lot of flashbacks. In one of them, Ig and Merrin are seen climbing into a treehouse. To me, the film implied that this treehouse was something they played in as children. Also, in my opinion, the film portrayed the main characters as mostly Ig and Merrin. The book begins in a similar way but it quickly reveals so much more. I soon learned a lot of backstory on Ig and Merrin’s families. Of course I learned a lot more about Ig himself and what he was thinking- as is easier portrayed in a book. But what struck me most while reading the novel was just how important the characters of Terry and Lee are. In the film, we don’t learn much about Lee’s home life. We don’t have details about his parents or his hardships. Terry does some pretty significant things that are overlooked in the movie as well. There’s a lot of backstory friendship between Merrin, Terry, Glenna, and Lee that unfortunately didn’t make it to the screen. Details about Merrin’s life in college are overlooked- as well as her relationships with her family members, Lee, and Ig. In the movie, Ig, Merrin, and Lee meet as children. In the book, they are teenagers. Merrin is transferring schools and comes to Lee and Ig’s town. The three of them become good friends because Lee and Ig are already best friends from the whole life-saving incident back when they were children. Furthermore, about that tree house I mentioned… It really seemed like no big deal when I watched the movie. But holy cow! Did I MISS something?! I feel like that treehouse is a central focus of the entire novel. 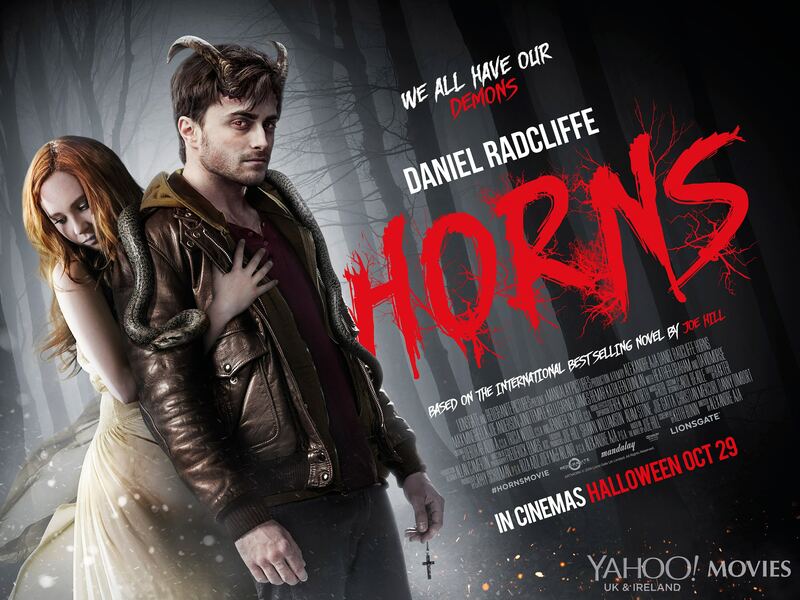 It all ties in to the horns and the dramatic scenes. Overall, what I’m saying is that it is difficult to intimately know each character. And it is even more difficult to portray that in a film. We know that. We’re writers. So after I watched this movie, I was drawn to read the book and have some of my questions answered. I was thrilled to find so much more. I’m happy I read it! I encourage you to check it out if you’re into this genre. You’ll probably want to watch the movie first so you aren’t disappointed. But you never know. They each bring something unique to the table. I’ll stop rambling now.